Smile Like You Mean it: Massive To Do List! Oh man! I usually take Saturdays and work like crazy getting things done because Scott is home to help out with Luke and keep him entertained--However, this weekend I spent working on a slideshow for our Relief Society dinner on Tuesday, AND Scott had to go into work for a few hours, so basically my whole Saturday was all screwy and nothing went as planned and I didn't get things done. Then Sunday was wack-o too, Luke sometimes refuses to go down for a nap and I either spend hours trying to get him to go down or just give up and let him stay up--meaning I don't get anything done. Monday = more slideshow ALL DAY. Tuesday, Luke woke up at 6 am, but all he wanted to do was nurse and sleep, he did that for a half hour, we moved to the couch and he fell asleep as I sang him songs. 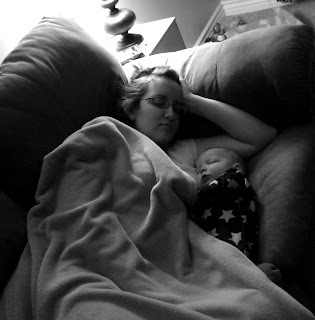 (Scott snapped this picture of us sleepin on the couch). It was really sad. He had a fever--it reached 102.2 in the afternoon and he slept more than he was awake. When he was awake he just wanted me to hold him or nurse him. Poor little guy. I spent a few hours in the morning at the church setting up for the dinner and I had to hold him the whole time--I wasn't even going to stay there very long but the guy who was meeting us to bring the projector and set it up for the slideshow didn't show up until nearly 2 hours after he was supposed to. Later, My arm was DYING from holding Luke all day--though I did get to watch a lot of TV shows I've been meaning to get to on the DVR. Fast Forward--I finally put Luke to bed at 5:50p and raced to get ready for the dinner. The dinner was fine, I got there late and there wasn't really room at the table I would have liked to sit at, but i made do. I was completey bushed and my contacts were SO annoying and bugging me the whole night. I had to stay to help clean up but not for too long because Angie told me to go home to Luke (she was there that morning when we were setting up and knew he was sick). Anyway, to make a long post longer, since the beginning of the week was so crazy and with Luke being sick I now have a MASSIVE to do list. Oi. Luke was much better yesterday, so I opted out of a trip to the doctor. He has a bit of a cough now and then but all in all I think most of the nasties has passed--apparently all that sleep did him good. BLAH. my house is a mess and I have a million other things to do. Thanks for all your wonderful comments on my other posts this week. Comments on blog posts really make me happy. Sorry for another comment about my own kid, but it's all I know these days... Sydney was sick last week, so I totally know what you're talking about. I had to hold her for two days and a night, and it threw us both off for awhile. She had a cold, an ear infection, and got 4 teeth! We're doing better now, and many of the things on my to do list have been rejected... I'm sticking to the most important (and housework is not included!). Hope you figure out how to complete your massive to do list. Um. You know I'm totally making fun of you for your little 'ouch my arm hurts' comment, right? Poor lukey though... sick babies are the worst. Mine has been sick too but finally getting better. Oh, this is when I wish I lived closer so I could be there to help out! I'm glad Luke is doing better--just do what you can and forget about the rest. The chores always wait, but the babies don't. And, why are you posting in the middle of the night? Go get some rest! Glad to see a picture of Mom and Son getting some snoozes in. I hope you are truly getting the rest you need. Amy came over today, and it was awesome to hold Alexander today, cant wait till you guys come and we get to actually hold Luke. Thanks again for all you do! Um. You know I'm totally making fun of you for your little 'ouch my arm hurts' comment, right? LOL, Jen. You must have some massive pythons from hauling around Isaac The Future Linebacker, eh?